URGENT DEADLINE TO FILE YOUR MLC COMMENTS! URGENT! Send your MLC comments to the Copyright Office! Endorse the AMLC by March 20! How Will Spotify’s IPO Impact Music Creators? WHOSE PRO IS IT, ANYWAY? As you know, the Music Modernization Act charges the Copyright Office with designating a Mechanical Licensing Collective (MLC) responsible for collecting and distributing royalties from streaming services. Now that applications are closed, the Copyright Office wants to hear what you think about the candidates hoping to be designated as the MLC. Comments may be submitted until April 22! • Board members without conflicts-of-interest. Only one MLC candidate, the American Music Licensing Collective (AMLC), has committed to these principles. Therefore, we are strongly recommending that all music creators submit comments supporting the AMLC. Whose royalties will flow through the MLC? You’d need a flow chart to understand it. Good news, we’ve got one at the bottom of this message! But we do know that the big publishers are unlikely to go through the MLC: they have direct deals with the streaming services. Most of the royalties will belong to tens of thousands of independent writers and publishers around the world. Some royalties will be unclaimed. 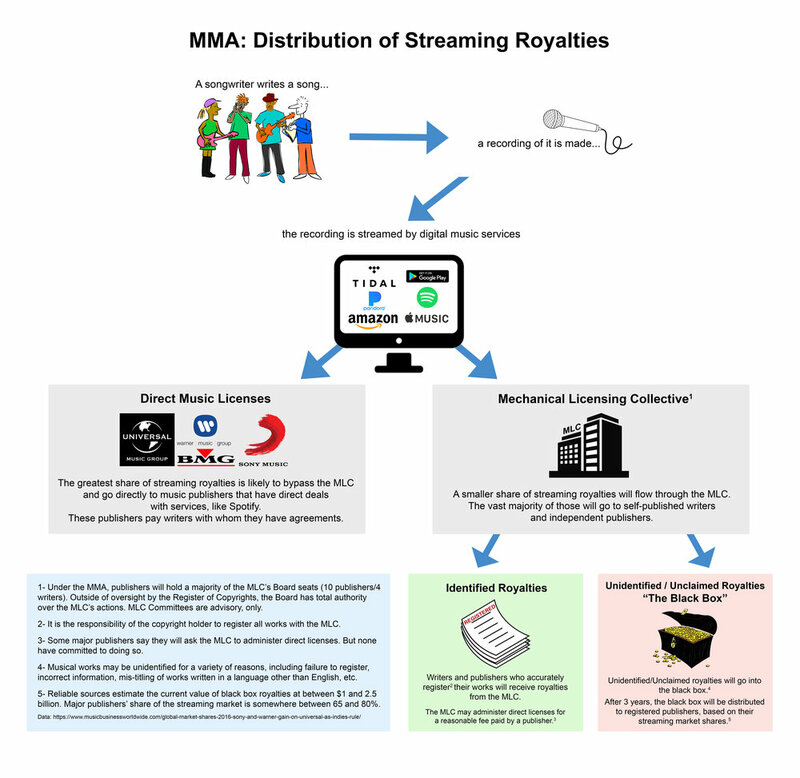 These will wind up in a so-called “black box.” Under the law, after three years, the MLC may distribute black box royalties to publishers based on their market share. This means that the largest publishers, many of whom sit on the Board of the other MLC candidate, will receive as much as 80% of the unclaimed royalties, estimated to be at least $1 billion. This is a giant conflict of interest, and if you're an independent writer or publisher, it could impact you directly. We hope you’ll weigh in. By submitting comments in favor of the AMLC, you’ll be taking a stand for a far more fair, more accurate, more independent MLC. PLEASE NOTE: MusicAnswers has agreed to serve as Observers to the AMLC, should it be selected as the MLC.